Herb Stoddard seen in familiar surroundings in 1964. Happy birthday to Herbert Stoddard Sr.! Raised in a working-class family, he had no formal education beyond primary school. Yet he went on to become recognized as the “father” of wildlife management and a pioneer in the emerging field of fire ecology during his career. He may rightly be considered one of the first ecological foresters as well. Born in Rockford, Illinois, Herb Stoddard made his career in the longleaf pine forests of the Red Hills region on the border of Georgia and Florida. At about age four, his family had moved to central Florida to grow oranges. There he learned from local cattlemen how fire worked in the longleaf system, experience that he applied later to his wildlife work. After seven years in Florida, the family returned to Rockford in 1900. Tired of school, Stoddard went to work on his uncle’s farm in Prairie du Sac, Wisconsin, and soon began an apprenticeship with a local taxidermist that led to museum jobs. You can learn more about the Birthday Boy from his memoir. We have a copy in our library. In addition to studying the quail on farmed lands, Stoddard looked at longleaf forests. It was there that he made his mark in forestry. Along with a handful of botanists, foresters, and land managers, he came to the realization that longleaf forests were dependent on frequent fire for their perpetuation. 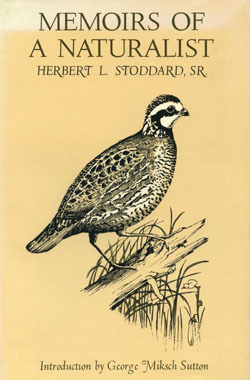 After the CQI ended and he had published his book, Stoddard established the Cooperative Quail Study Association in 1931 with funding from local landowners to continue his research. The Red Hills quickly became a center for ecological research, and eventually led to the establishment of both the Tall Timbers Research Station in Tallahassee, Florida, and the Joseph W. Jones Ecological Research Center near Albany, Georgia. The FHT article uses excerpts from oral history interviews conducted with Neel in 2004. Those interview tapes may be found here in Durham in our archive. Because there is so much more to this story than can be covered here, we recommend starting with Bert Way’s article as a primer and then moving on to the book about Neel and Herb Stoddard to learn more about the Stoddard-Neal Method and the man who created it. This is a nice article. I was in Thomasville the other day when I ran across Leon Neel’s book in Kevin’s. I was checking out and the names on the book caught my eye so I had to buy it. Found this blog after doing a search on the book. Herbert Stoddard was my great-grandfather; I grew up on the plantation that he was given during the time of his studies for the Biological Survey. Great to see people are still passing along his story. I am currently doing research on Callicarpa americana (American beautyberry) for a class at Clemson University. This plant is eaten by Northern Bobwhite-the number one bird species in decline on the Audubon Blue List. It was a delight to read this article about Herbert Stoddard, Sr. and to discover what a forward thinker he was as well as an excellent naturalist. Thanks to him for his conservaton efforts in trying to protect the Bobwhite. When I am finally finished with my paper, I plan on reading more about this remarkable man and passing on his story. I graduated from the University of Georgia Warnell School of Forestry and Natural Resources in 2006. I actually went to school with Herbert Lee Stoddard IV while I was studying what his great grandfather, Stoddard Sr., accomplished in the field of wildlife management. Their family has a rich history in wildlife management as well as genuine love for the outdoors. It’s an honor personally knowing Stoddard Sr. great grandson. Just saw Mr Studdards name mentioned in Garden & Gun. It brought back memories. I am sure my dad referred to his work while doing research for his book on quail.